Springston, Idaho is described online as a ghost town, but the only ghostly thing here is the remains of the Golden Star tug beached against the left bank of the Coeur d'Alene River. Ghost town experts have a category for "barren" ghost towns, where virtually nothing remains. This accurately describes Springston. The phrase "former townsite" is alternately used for places like this. Nowadays, Springston is a trailhead on the Trail of the Coeur d'Alenes bike path, three miles northeast of Harrison. It consists of a parking lot and restroom. The Golden Star tug was constructed in 1937 for the Russell and Pugh Lumber Company. Capt. Glen Addington and his crew spent many nights on the Golden Star, towing huge brails of logs down the St. Joe and Coeur d'Alene Rivers to Springston for milling. The Golden Star was 63 feet long and 14 feet wide, and was originally driven by a 48-inch propeller powered by a compound steam engine. The brass-trimmed engine had been salvaged from one of the early boats on the lake. When the Golden Star was converted to diesel in 1945, the old engine was moved into the Russell and Pugh mill to power a conveyor belt. The tug served another decade after that, then was finally laid to rest on this spot in 1955. Springston Today: Springston Trailhead, Trail of the Coeur d'Alenes. Vestiges of the Golden Star tug on bank. Springston, Idaho, was originally named Anderson, for the lake that lies immediately to the southeast. 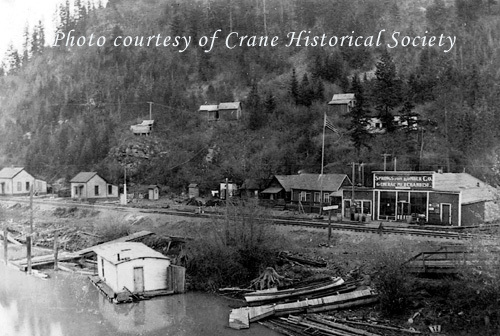 It was a stop on the Oregon Washington Railway & Navigation line and served as a shipping point for lumber. Trains that carried passengers and freight came through four times a day. Farmers would ship their cream out on the train to markets in Spokane and come back a few days later to pick up the empty cans. Springston Lumber Co. was built in 1901. Their office was in Spokane. The mill burned in 1907, and three employees died trying to douse the flames that started when sparks dropped from the smokestack into a pile of cottonwood. A strong and dry August wind whipped the flames into a frenzy that burned the mill, out buildings, and half the lumber in the yard. The men who died were trying to fight the fire by bucket brigade with water from barrels placed around the property. They had just managed to move the organ out of the church when a big gust of wind came up. They lost their lives as they ran uphill in an attempt to get away from the flames. Only one of them was identified in a Spokesman-Review article: Otho C. Acton of Spokane. The others were "a Jap," and a man whose name was unknown because he had only been working at the mill for a couple of days. A new sawmill was constructed in 1908, which Russell and Pugh bought. A bunk house and two-story hotel was also built to house the construction workers. In those days it was not unusual for men to stay at a job site all week, while the women and children remained at the homestead doing chores, caring for livestock and gardens. Springston was a company town comprised of a railroad depot, depot agent’s home, company store, boarding house, post office, saloon, school, at least 14 residences, float homes, and a warehouse that stored tugboats. 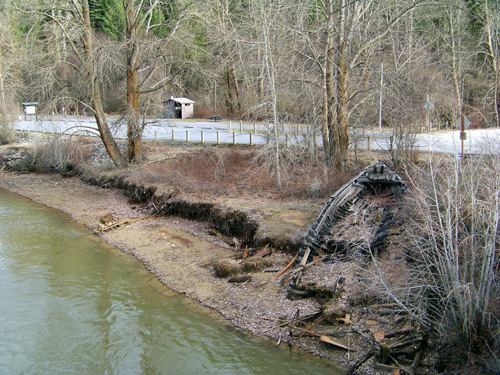 It all became submerged occasionally, such as during the flood of January of 1918, which collapsed many of the wooden bridges in the vicinity, including the one at Rose Lake. The Rose Lake bridge was pushed down river in the torrent of water, until it got stuck at Springston, where it created a huge log jam. Unlike Harrison, which was quite progressive, there was still no electricity or running water in Springston until the 1920s. Water for laundry and bathing was taken from the river and potable water was carried from a nearby spring. The first bridge over the Coeur d'Alene River at Springston was "S" Shaped. It was constructed of wood in 1919 when Russell and Pugh moved their entire operation from Harrison to Springston. The old wooden bridge was replaced in 1955 by the current steel model with wooden planks. Prior to roads and bridges, the county operated the Springston Ferry to transport passengers, animals, and supplies across the river. The store was situated about where the restroom is today. Settlers from Thompson Lake, Blue Lake, Harrison Flats, Medimont, and Rose Lake came to shop there, and old timers fondly remember the great variety of goods available there. The company store had everything a busy homesteader needed: guns and ammo, tackle, hardware, wash boards, tubs and wash boilers, calked boots, rain gear, electrical appliances, fresh fruits, vegetables, and canned foods. They also carried birthday cards, jewelry, and clothing. The back room held the butcher block and hamburger machine where the store keeper cut beef and pork to order. This room also had all sizes of nails, spikes, sweaters, wool socks, soft drinks, and a large walk-in cooler. Inside the door was a row of credit books with names of many local customers. There was a corn cob pipe display by the counter. Another room had bolts, pipe fittings, paint and brushes. After the road came through, there were gas pumps outside, and the warehouse carried automobile tires, motor oil, cow feed, stove pipe, singletrees, chain, wallboard, pike poles, and plywood. The Russell and Pugh mill stayed in business until 1964. After the mill closed the town disappeared with it. What happened to Springston, Idaho? Did it disappear all at once, did it burn, was it carried off piecemeal, or what? If you know what happened to the various buildings or their contents, or if you have corrections to this story, please leave a comment below. Use "Springston" as a heading to your comment. Thanks.